In the Fifteenth Century, pilgrims flocked to the Basilica of Sant’Andrea to venerate the most famous relic in the city of Mantua, drops of Christ’s blood collected at the crucifixion (or so the faithful believed). In fact, the church Sant’Andrea was erected to accommodate the huge crowds that arrived on holy days and who, in turn, helped fund its construction. Today, art historians admire Sant’Andrea’s Early Renaissance design for elegantly bringing the grandeur of ancient architecture into a Christian context. Sant’Andrea is built of bricks, though they are mostly concealed by painted stucco. 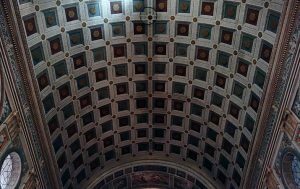 The patron, Ludovico Gonzaga, estimated that at least 2 million bricks were needed. The bricks were baked in onsite kilns, making the church far less expensive and faster to erect than a building made with stone, which had to be quarried, transported, and finished. Gonzaga was the Marquis of Mantua—and in addition to employing Alberti, he appointed Andrea Mantega as court artist. 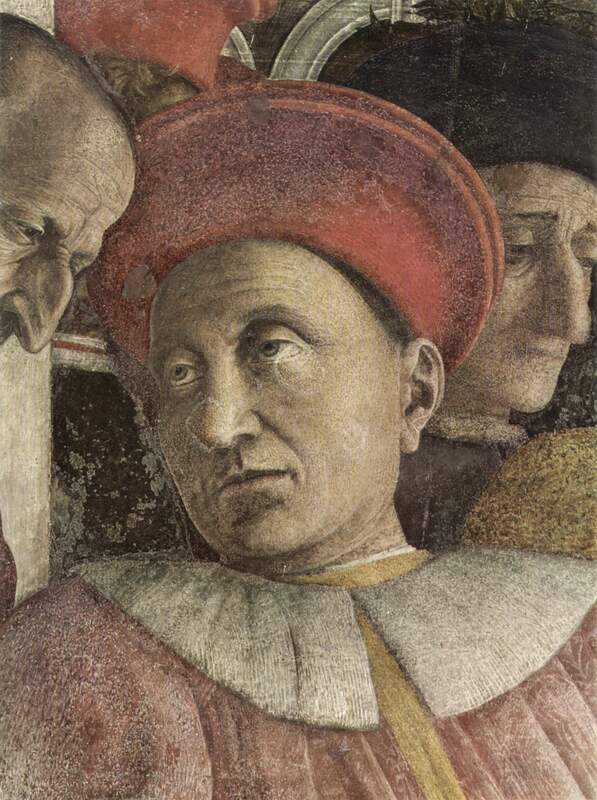 His portrait is featured in the frescos Mantegna painted in the Camera degli Sposi (also known as the Camera Picta), in the Marquis’ palace. 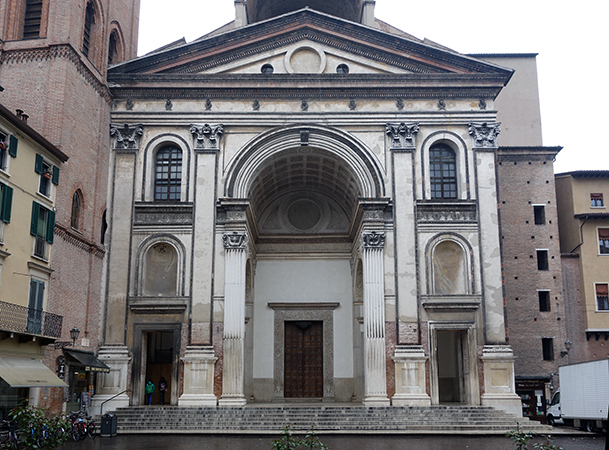 The sections of the building constructed in the Fifteenth Century, including the Western façade and the nave up to the transept, are usually attributed to the humanist and architect Leon Battista Alberti, even though he died in Rome a few months before construction began in June 1472. Alberti was an expert on all things ancient and he wrote the first Renaissance architectural treatise. Alberti probably made a model to explain his design and he definitely sent Gonzaga a drawing (now lost), and a short description of his plan in a letter dated 1470. Despite this, it is uncertain how much of the building follows Alberti’s design, how much comes from the Florentine architect Luca Fancelli who directed construction, and how much should be credited to Gonzaga, who closely supervised the project. Questions of Sant’Andrea’s attribution are important because it is such an ingenious, unified combination of three ancient Roman forms: temple front, triumphal arch, and basilica. On the façade, four giant pilasters with Corinthian capitals support an entablature and pediment. Together these elements recall the front of ancient temples, such as the Pantheon in Rome. There is also a grand arch in the center of the façade that is supported, at least visually, by two shorter fluted pilasters. Taken together, the lower façade, with its tall central arch and flanking side doors evoke ancient triumphal arches such as the Arch of Constantine. The center arch extends deep into the facade itself, creating a recessed barrel vault that frames the main entrance to the church. 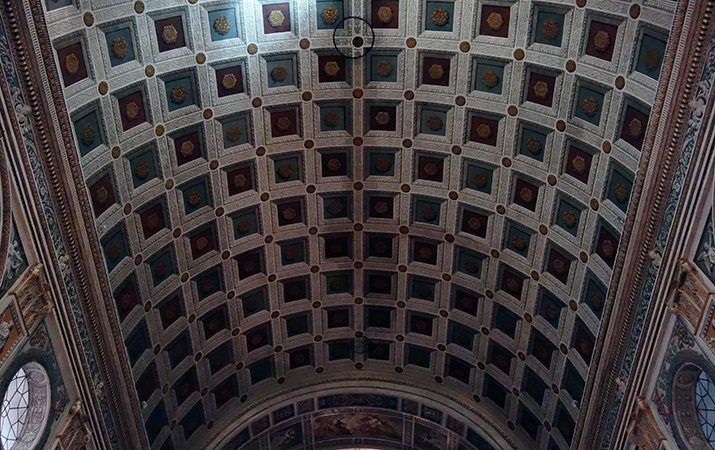 The arch and its coffered barrel vault form a perfect setting for processions of the holy relic and the celebration of Christ’s triumph over death. Such spectacles would recall ancient processions where victorious warriors paraded through Rome’s triumphal arches. 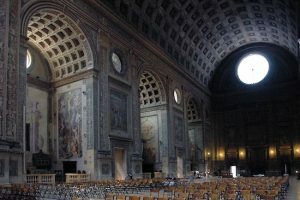 When pilgrims pass under the arch and into the nave (the long interior hall), after their eyes adjusted to the purposefully dim, mystical light, they would look up and see a second, much more massive barrel vault, the largest constructed since ancient Rome. 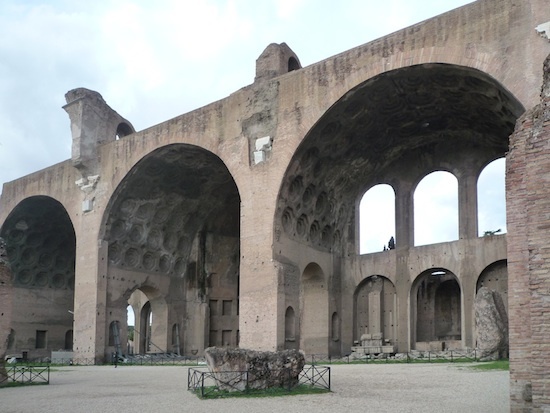 Then, on both sides of the nave they would find three chapels with lower barrel vaults. Surprisingly, there are no side aisles or rows of columns, as at the old St. Peter’s in Rome or other early churches like Santa Sabina. Sant’Andrea’s huge central space and buttressing side chapels strongly resemble the layout of the ancient Basilica of Maxentius and Constantine in the Roman forum (below). The basilica plan is perfectly suited to large churches since it could accommodate massive crowds. 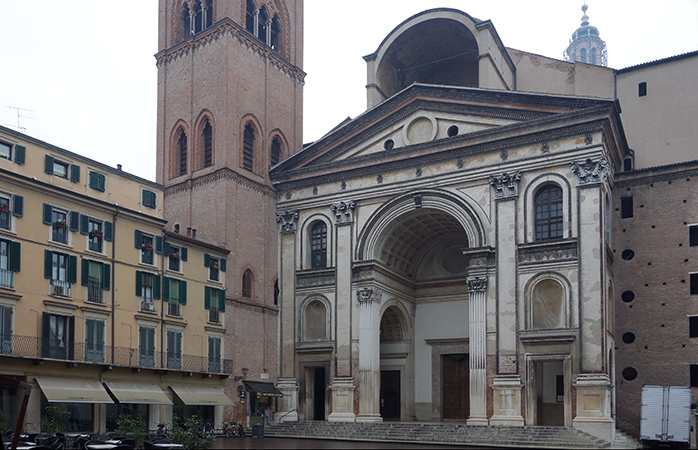 But unlike earlier basilica-plan churches, Sant’Andrea’s plan seems to return more strictly to the ancient forms. 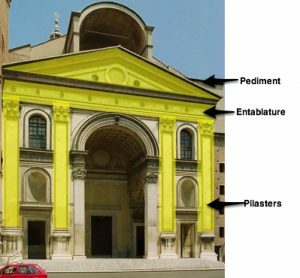 It’s even possible that Sant’Andrea’s unusual plan and all’antica (“after the antique”) façade impacted the new St. Peter’s and the Church of the Gesù in Rome. This entry was posted in Architecture, Art History, History, Renaissance. Bookmark the permalink.